Penn law professor John Bradley argues that in the wake of the Johnny Bobbitt saga, for-profit crowdfunding sites should hold themselves to the same standards of transparency as nonprofits. This is a guest post by University of Pennsylvania Lecturer of Law John Bradley. How safe is your GoFundMe donation? That question is starting to be asked by law enforcement, including the New Jersey attorney general, as well as the donors of $402,000 that has gone missing. Starting late last year, more than 14,000 people contributed to the crowdfunding site to benefit Johnny Bobbitt, who, while homeless, came to the aid of a stranded motorist with his last $20. The motorist and her boyfriend set up a GoFundMe campaign and then allegedly misappropriated the funds for their own use. GoFundMe, Inc. is a privately owned for-profit organization. Many people may be surprised that it is not a charity, and its status raises particular transparency and oversight issues. Nonprofit organizations must have controls in place to safeguard funds and are required to provide reports to government regulators if money is misused. GoFundMe is not required to provide any accounting to the public or the government about how much money has not gone to its intended recipient. In contrast, GoFundMe operates free from those mechanisms and largely decentralizes control of the funding. As a result, three particular issues arise as to the ethics of how for-profit crowd-funding platforms do business. 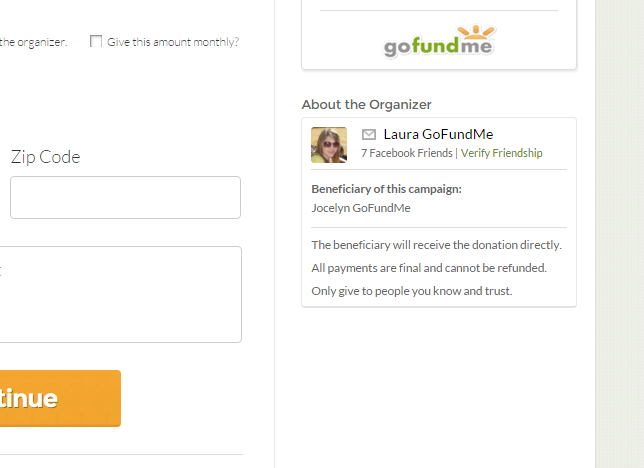 Most particularly, GoFundMe is not required to provide any accounting to the public or the government about how many fraudulent campaigns it has hosted or how much money has not gone to its intended recipient. And GoFundMe doesn’t disclose that information voluntarily. Its annual report contains none of the detailed financial information required of nonprofit organizations. Consequently, neither its donors, potential campaign organizers, nor the general public have any idea of the extent to which GoFundMe’s funds are misused. It may be that the company has not tried to find out the answer. But such data is crucial for assessing the legitimacy of the platform. Second, while a charity controls the funds it raises and uses it to assist beneficiaries whom meet certain criteria, GoFundMe puts the control in the hands of the individual “campaign organizers.” Whether the funds go directly to the intended beneficiary or are placed in the control of the campaign organizer is a decision left to the organizer herself. If the organizer decides to route funds through herself, GoFundMe puts the burden on donors to decide whether their donation is in good hands. But first donors must recognize who will receive the donation, which requires noticing and understanding a single, perfunctory, small-print sentence on the donation page. If the funds are going directly to the beneficiary, the page states: “The beneficiary will receive the donation directly.” If the campaign organizer is getting the funds, it states, “This person will receive your donation directly.” If crowdfunding sites are interested in full disclosure and informed donors, that explanatory sentence should be more prominent and explain in clear terms the difference between funds that go to the beneficiary or the organizer. Finally, GoFundMe seeks to assure donors that their contributions will be used as intended through its “GoFundMe Guarantee,” which purportedly “is here to protect donors … and beneficiaries … in the very rare instances of misuse.” The GoFundMe guarantee policy claims to protect donations through refund and redirection. But the guarantee is more flash than substance. To make the refund guarantee real, GoFundMe should commit to redistribute to the beneficiary or refund to the donor all of the money once misuse is confirmed. While the guarantee promises to refund donations up to $1,000 per campaign, it requires that the donor submit a claim for a refund within 30 days of the donation date. There are two problems with these requirements. When the average donation is some $67 – or a mere $28 in the Johnny Bobbitt campaign – few donors will likely submit a claim. As a result, it is likely that many donations that don’t reach their intended target are not refunded. Second, the window for submitting a claim is too narrow. It is quite possible that evidence of misuse will arise well after the 30-day window has closed. To make the refund guarantee real, GoFundMe should commit to redistribute to the beneficiary or refund to the donor all of the money once misuse is confirmed. It should not rely on individual claims to be made, nor should it condition refunds on the timing of the donation. The guarantee also states that the intended beneficiary will receive funds that the campaign organizer failed to deliver — but only up to $25,000 and again only when a claim is filed within 90 days of the campaign creation date. Either the monetary cap or the short time span could easily prevent the beneficiary from receiving the funds. And while GoFundMe has announced it will work to make sure that in Bobbitt’s case, he receives the full funds, this shouldn’t be a one-off decision made when the public glare is unusually intense; if money is raised for a beneficiary through GoFundMe’s platform, the guarantee should make the beneficiary whole (without a monetary cap). As for the time frame in which a claim must be brought, GoFundMe should look to the analogous situation in a court of law, in which case a claim would need to be made within one to two years, not three months. GoFundMe and other crowdfunding platforms act in the charitable fundraising space, but when formed as for-profits, they avoid the controls and transparency required of nonprofit organizations. If they want to continue to operate in this arena, they should hold themselves to similar standards. Fuller disclosure at the time of donation, a more robust dedication to seeing that beneficiaries actually receive the proceeds raised for them, and increased transparency about the extent of misuse on their site would be a good start.